With table toppers Shotley Bridge having had their wings clipped by Swalwell the previous week, a chink of light had opened up for the Mighty Acorns. But on Saturday at the same time as the Bridge were going down to a second successive defeat at the hands of Lanchester, seamer Ul-Haq was leaving his mark on the Ashington innings. Victory for the Colliers would have seen them close the gap even further on Shotley – but although they have now dropped a place to fourth and stand 67 points adrift of new leaders Swalwell, skipper Sean McCafferty believes his outfit will still be in contention when the campaign comes to an end on September 8. “With Shotley losing again, our defeat is really a kick in the teeth,” he said, “It would have been a nice game for us to win today against Newcastle City putting us right back into contention but the reverse doesn’t really change things between Shotley and ourselves. Ben Harmison was the only Ashington batsman to get to grips with Ul-Haq and the rest of the City attack as he struck six boundaries in a superb unbeaten knock of 62 in two and a half hours, scoring more than half of his sides total which fell away badly from a position of 72-2 to 114 in 38 overs. Yet despite losing Jack Jessop in the third over, the home side had made a decent start at 50-1 after 16 overs. Dan Grant was then caught behind by Sandeep Padmalaya for 31 – the first of Ul Haq’s victims – but more significantly, Ben O’Brien’s departure via an lbw shout was the blow from which Ashington never recovered as it sparked off a speedy collapse with Ul-Haq the chief destroyer. 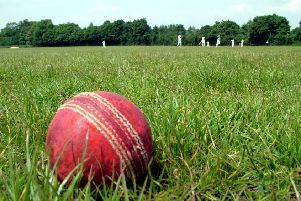 In reply, Ashington needed to strike early,and Harmison obliged in the ninth over with a double wicket maiden, but Newcastle went on to win by six wickets.